It came to pass that the Tlish Diyan--Snake Clan--sprang from the magical mating of an animal and a human. It happened in a village in what is now known as Blue House Mesa in days beyond history's records, far beyond any living memory, deep in the time of legend. The village is now in ruins: the roofs are gone and the hearths are cold. But when it was alive, it was the home of a beautiful maiden, Kaliña, the daughter of a Godiyihgo, an Enlightened or Holy One. Though beautiful, she had one strange trait: she could not endure the slightest speck of dirt on her clothes or person. A sacred spring of water lay at the bottom of the mountain. It was known as sacred to Kato'ya and his sister, Tashiña, the rattlesnake twins. Kaliña spent almost all of her time at this spring, washing her clothes and bathing herself over and over. The defilement of these sacred waters?their contamination by the dirt of her apparel and of her person?angered the Snake Twins. They devised a plan to punish her. When Kaliña next came to the spring she was startled to find a smiling baby boy gurgling and splashing in the water. Of course, it was Kato'ya, who, like other Spirit Beings, was able to assume any form at will. The girl looked all around?north, south, east, and west?but saw no trace of a person who might have left the beautiful child. Whose child can it be? Kaliña wondered. Only a cruel mother would leave her baby here to die. Kaliña talked softly to the child, took him into her arms, and carried him up the hill to her village. There she brought him back into her wickiup, where she lived apart from her family because of her loathing of dust and dirt. As she played with the baby, laughing at his pranks and smiling into his face, he answered in baby fashion with coos and smiles of his own. Meanwhile her younger sisters had prepared the evening meal and were waiting for her. "Where can she be?" they asked. "Probably at the spring, as usual!" said their father. "Run down and call her." But the youngest sister could not find Kaliña at the spring so she came home and went to Kaliña's wickiup. There she found the maiden sitting on the floor and playing with the beautiful baby. On hearing this the father was silent and thoughtful, for he knew that the waters of the spring were sacred. When the rest of the family started out to go see the child the father called them back, saying, "Do you suppose any real mother would leave her baby in a spring? This is not as simple as it seems." Since the maiden would not leave the child, the family stayed at home and ate without her. In Kaliña's wickiup the baby began to yawn. Growing drowsy herself, Kaliña put him on the bed and fell asleep beside him. Kaliña's sleep was real, but the baby was just pretending. He lay quietly and then began to lengthen, drawing himself out, extending longer and longer. Slowly Kato'ya, the sacred male snake appeared, like a nightmare come true. He was so huge that he had to coil himself around and around the wickiup, filling it with scaly, gleaming circles. Placing his enormous head near Kaliña's, Kato'ya surrounded her with his coils and finally took his own tail into his mouth. So the night passed, and with it went Kato'ya's anger. He found himself delighted with Kaliña's musings when he had been in the baby's form. And now, as the hours passed, he continued to play these events over and over again in his mind. In the morning when breakfast was ready and the oldest sister had not come the others grew impatient. "Now that she has the child nothing else matters to her," the old man said. "A baby is enough to absorb any woman's attention." But the smallest sister went to Kaliña's wickiup and called to her. Receiving no answer, she pushed the door, first gently and then with all her might. She could not move it and so she became frightened. Running home to where the others were sitting, she cried for help. Everyone except the father rushed out, and pushing together they cracked the door just enough to catch a glimpse of the snake's great scales. They screamed and ran back. The father, sage that he was, told them quietly, "I expected as much. I thought it was impossible for a woman to be so foolish as to take such a child to her bosom." At Kaliña's wickiup he pushed against the door and called, "Oh Kato'ya, it is I who speak?Godiyihgo 'ishkiñihí. I pray to you, let my child come to me again and I will make atonement for her errors. She is yours; but let her return to her family once more." Hearing this Kato'ya began to loosen his coils. The whole building and the whole village shook violently, and everyone trembled with fear. At last the maiden awoke and cried piteously for help. As the coils unwound she was able to rise. The great snake bent the folds of his body nearest the doorway so that they formed an arch for her to pass under. She was half stunned by the din of the snake's scales, which rasped against one another like the scraping of flints under the feet of a rapid runner. Once clear of the writhing mass, Kaliña was away like a deer. Tumbling out of the wickiup she ran to her father's home and threw herself into her mother's arms. But Godiyihgo 'ishkiñihí, remained, speaking reverently to the snake. He ended with, "It shall be as I have said; she is yours!". . 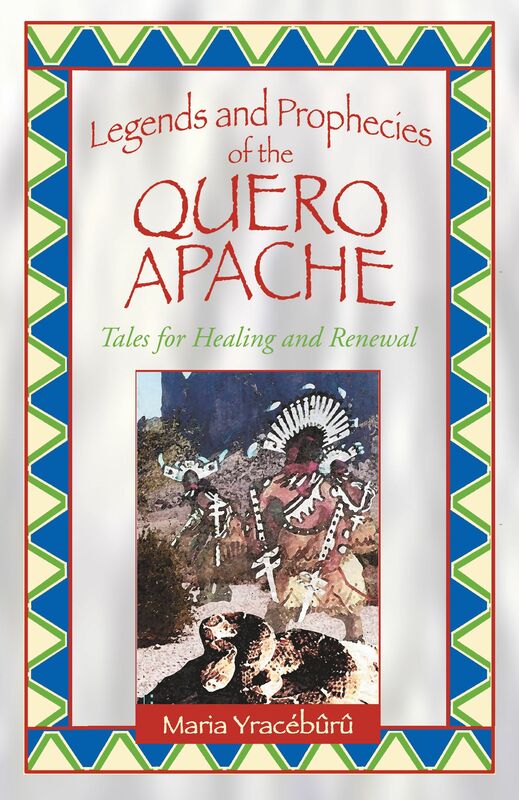 . .
Maria Yracébûrû is a Quero Apache Tlish Diyan 'tsanti--a storyteller, healer, ceremonial facilitator, and teacher of the Snake Clan knowledge and philosophy. As a 'tsant' trained since birth by her grandfather Ten Bears, she is the guardian of ancient and mysterious knowledge that has been passed down through countless generations. A healer and teacher for over 25 years, Maria's articles have been translated into 20 different languages. She lives in San Diego, California. – Patricia Diane Cota-Robles, author of What on Earth is Going On?